America’s landscape is undergoing a profound transformation as demand grows for a different kind of American Dream--smaller homes on smaller lots, multifamily options, and walkable neighborhoods. This trend presents a tremendous opportunity to reinvent our urban and suburban areas. But in a time of fiscal austerity, how do we finance redevelopment needs? In Foundations of Real Estate Development Finance: A Guide for Public-Private Partnerships, urban scholar Arthur C. Nelson argues that efficient redevelopment depends on the ability to leverage resources through partnerships. Public-private partnerships are increasingly important in reducing the complexity and lowering the risk of redevelopment projects. Although planners are an integral part of creating these partnerships, their training does generally not include real-estate financing, which presents challenges and imbalances in public-private partnership. This is the first primer on financing urban redevelopment written for practicing planners and public administrators. In easy-to-understand language, it will inform readers of the natural cycle of urban development, explain how to overcome barriers to efficient redevelopment, what it takes for the private sector to justify its redevelopment investments, and the role of public and nonprofit sectors to leverage private sector redevelopment where the market does not generate sufficient rates of return. 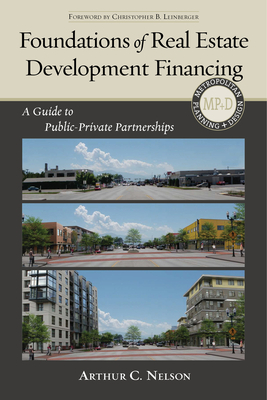 This is a must read for practicing planners and planning students, economic development officials, public administrators, and others who need to understand how to leverage public and non-profit resources to leverage private funds for redevelopment. "The book does a fantastic job of making the intricacies of the development financing world easy to understand." "Arthur c. Nelson has written a policy guide and practical workbook."